Lieutenant Commander Amit Bhalerao assumed the charge of Administrative Officer, Sainik School Korukonda on 21 June 2018. He was commissioned in Indian Navy on 06 July 2009. He belongs to Gwalior and has pursued his B.E in Mechanical Engineering from ITM University, Gwalior and Masters in Under Water Science & Technology from Cochin University of Science and Technology, Kochi. In his short and eventful career so far, the officer was appointed at the prestigious Indian Naval Academy, Ezhimala as an instructor. 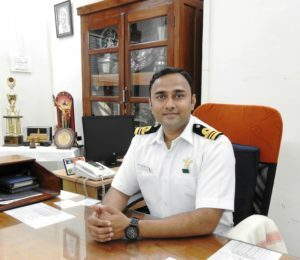 Post instructional tenure at INA, the officer underwent Anti Submarine Warfare specialization course for one year at Anti Submarine Warfare School, Kochi. Prior to his present posting, he served for 04 years as Instructor at Anti Submarine Warfare School, Kochi, wherein he was highly instrumental in upgrading the training infrastructure of the school, and also planning & executing International Officers training at the school. The officer is a keen sports enthusiast, loves gardening.